The property is approximately 645 acres in size. The terrain is varied with steep canyon walls, gentler slopes, and semi level canyon bottom. Elevations range from 3,780 ft. to 4,475 ft. A county road runs through the property. You can enjoy hiking on Ranch A grounds and the adjacent Black Hills National Forest lands. There is no swimming pool or tennis court, but you can wade in the creek and enjoy horseshoes and volleyball. Sand Creek runs through the property. The creek sustains fish and other aquatic life, provides recreation and scenic value, and is a source of drinking water for wildlife and livestock. You may encounter cows while you are enjoying the Ranch A facilities. They are part of the Hazard Reduction Fire Suppression Plan administered by the State of Wyoming. The cattle eat, and the grounds get groomed, reducing the potential fuel for fires. 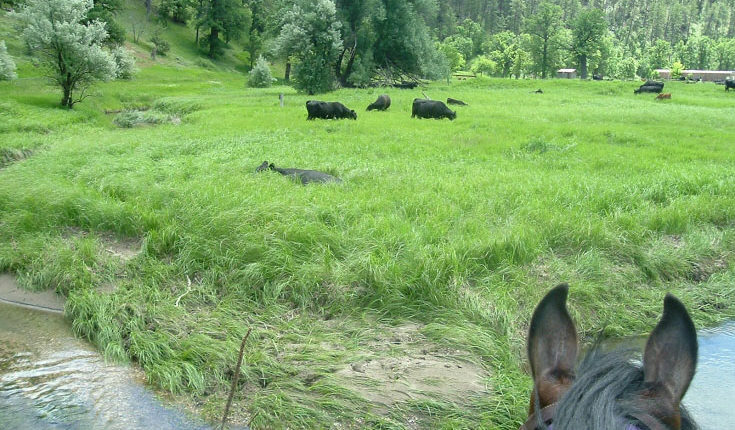 These pictures shows the view from horseback as the cows are being supervised while they work. Birds, turkeys, deer, elk, antelope, mountain lions, and other wild critters may be watched on the grounds. There is no hunting allowed. Fishing is allowed with a valid Wyoming License. Sand Creek is considered a world class fly-fishing stream. The many joys of fishing this beautiful stream include sightings of bald eagles, blue herons, deer and other wildlife. The South Dakota School of Mines & Technology holds one or two sessions of field camp at Ranch A each summer. The rock outcrops and other geologic features provide learning opportunities for the students.